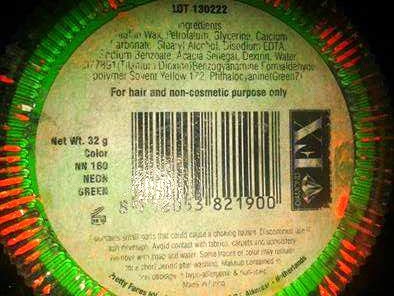 Paintertainment: WARNING: "Not For Cosmetic Use" or "For Hair & Special Effects"
WARNING: "Not For Cosmetic Use" or "For Hair & Special Effects"
So you've just spent a small fortune on neon makeup for your kit, only to turn them over and read something to the effect of "not for cosmetic use" or "for hair and special effects." You proceed to panic, wondering how any reputable face paint retailer could have mislead you by selling this paint in their store. Perhaps you are starting to think horrific thoughts of all those poor children you painted at your last gig getting ghastly boils on their beautiful skin, and parents lining up to sue you. Or maybe you're wondering why you see so many face painters with neons in their kit if they are not made for skin. "I personally am pretty neutral on the topic of whether to use neon / UV paint or not. They are cool if you have a black light event, but I've yet to book one of those. I find them to be really transparent, and require a lot of working up to get decent coverage, so I just don't tend to use them much for that reason alone. I say this to let you know that I have no agenda whatsoever on this topic...I am not trying to steer you towards one view or another. If you're looking for that sort of thing, you can find a plethora of artists in Facebook groups and message boards who are extremely passionate about this issue and dying to help sway your decision through endless comment threads! Please don't start one of those here on this post as the purpose is not to start another age old debate...my goal in this post is solely to gather all the research and facts that I can and put them in one place, removing any opinions or hearsay, making it easier for you to make your own informed decision. Remember that I am not a lawyer, a doctor, or an expert in cosmetic safety or manufacturing...I am simply a curious face painter who wants to paint responsibly, just like you. In the end, YOU are responsible for the choices you make for your business. If you come across any other expert opinions, direct quotes from manufacturers, or personal experience with neons, please do feel free to leave a comment! My hopes is that this will be an evolving article that can be updated as any new information becomes available." Why are those warnings there? The FDA has not tested the UV reactive pigments that these companies use in their paints specifically for the use in cosmetics. However, most face paint manufacturers have had independent testing done of their neon makeups, finding them to be safe for use on skin. "Companies and individuals who manufacture or market cosmetics have a legal responsibility to ensure the safety of their products. Neither the law nor FDA regulations require specific tests to demonstrate the safety of individual products or ingredients. The law also does not require cosmetic companies to share their safety information with FDA. FDA has consistently advised manufacturers to use whatever testing is necessary to ensure the safety of their products and ingredients. Firms may substantiate safety in a number of ways. FDA has stated that "the safety of a product can be adequately substantiated through (a) reliance on already available toxicological test data on individual ingredients and on product formulations that are similar in composition to the particular cosmetic, and (b) performance of any additional toxicological and other tests that are appropriate in light of such existing data and information." (Federal Register, March 3, 1975, page 8916)." This is why no one can claim that their product is FDA APPROVED, because the FDA does not "approve" cosmetics. They only approve ingredients, like pigments, which go into cosmetics. So, while some cosmetics might be labeled "FDA Compliant," no cosmetics themselves are technically "FDA Approved." So what DOES the FDA do as far as cosmetic regulations go? It acts on ingredients that have already been established as harmful. Neon pigments have not been proven to be harmful for cosmetic use, at least as far as my research has shown. (If you've found facts otherwise, please let me know so I can update this post!) The FDA has not put them on the top of their list of products to test because, according to their own website, the FDA only "acts on products that are established to be harmful to consumers when used as intended." 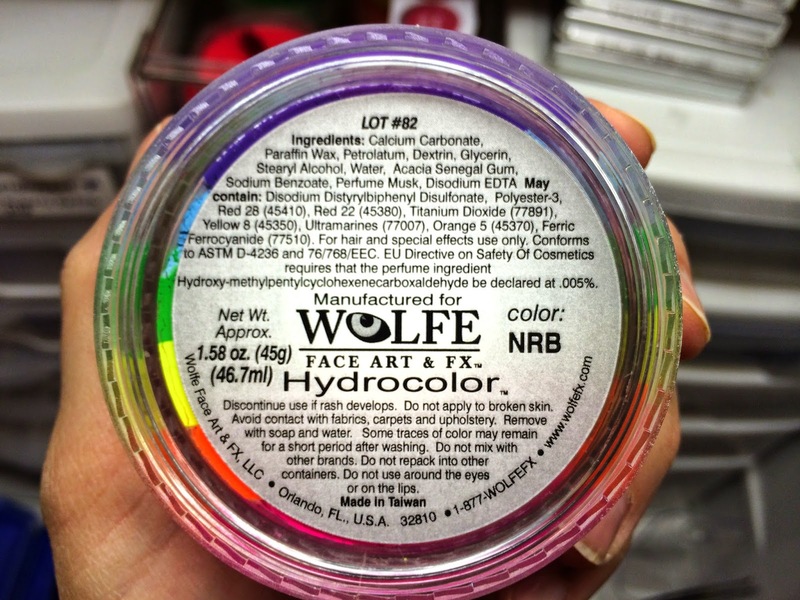 This leads us to believe that neon face paints have not been found to be harmful enough to concern the FDA. Although, the fact that the packages label them in such a way as being intended for "hair and special effects" renders any complaints about skin reactions invalid since that is not the intended use as printed on the package. So in essence, the FDA is passing the responsibility on to the manufacturers, who are in turn passing the responsibility on to YOU. The FDA also admits that they do "not have the resources to sample and analyze all cosmetics on the market." It regulates what verbiage is on the packaging. Because the FDA has not yet tested these pigments for use in cosmetics, The Fair Package and Labeling Act requires that manufacturer label their packaging with restrictions as far as whether certain pigments shouldn't be used around the eyes, lips, etc, regardless of any glowing reviews that they may have received with their independent testing. 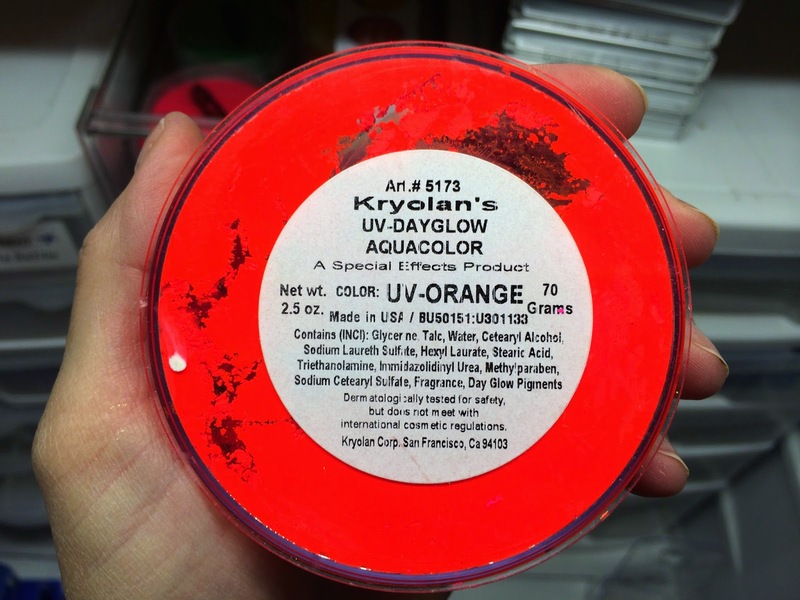 Kryolan UV-Dayglow: "A special effects product. Dermatologically tested for safety, but does not meet with international cosmetic regulations." Diamond FX Neon Package: "For hair and non-cosmetic purpose only"
Global Neon package: "Special FX Product - Prosthetic Paint - (For Professional Use Only) - not for cosmetic use"
Kryvaline Package: "Keep away from eyes; discontinue use if rash develops." 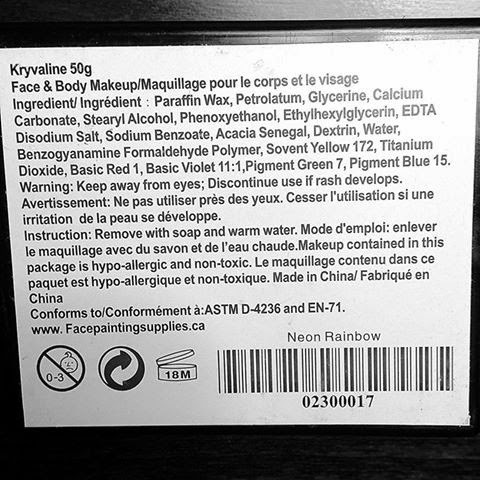 I don't believe Kryvaline uses FDA compliant pigments, yet they don't warn against cosmetic use...perhaps as they are made in Canda? If anyone has more info on this brand, please do share! Why do some say "for professional use only?" I'm not certain but my HUNCH (NOT a fact) is that it has something to do with the Fair Packaging and Labeling Act (FPLA) which states that the FDA requires that a cosmetic label have a list of ingredients if they are marketed on a retail basis to consumers. "...This requirement does not apply to cosmetics distributed solely for professional use, institutional use (such as in schools or the workplace), or as free samples or hotel amenities." But of course face paints ARE marketed to consumers as well so I'm not sure if this is right. If anyone knows more about this warning, please let us know! What About Other Words Like ASTM Conformity, Hypoallergenic, and Non-Toxic? ASTM stands for American Scientific Testing Methods. ASTM conformity does not equal cosmetic safety or FDA compliancy as a cosmetic. It only means that it meets a certain standard, as defined by the ASTM number. 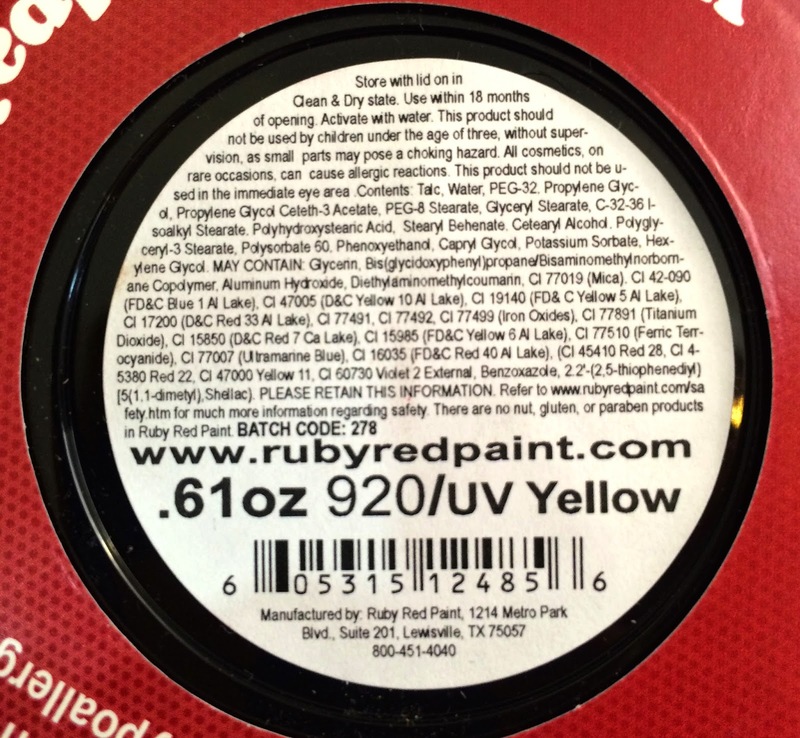 Most face paints have some note that they "conform to ASTM D-4236." This standard means that the product has been tested for toxicity, and that the paint is required to list anything hazardous if applicable. Sharpie markers and acrylic paint are labeled with the same number. As we all know as professionals, acrylic paint is NOT intended for or safe for skin and neither are permanent markers. ASTM designations are there to note that a product is safe if it is used for it's intended use as described on the label. The word "hypoallergenic," meant to convey that a product is less likely to cause allergic reactions, is really just a marketing term used to sell. It does not mean that it won't cause allergic reactions, or that it is gentle on your skin. A package may or may not say why they consider it hypoallergenic. There is no regulation of this term, and no science behind it. Manufacturers are not required to test and prove that their product causes less reactions in order to use this term...for these reasons, it is nothing more than a buzz word. NO cosmetic company on the planet can claim that their products will not cause a reaction on anybody, neon or otherwise. Everyone's body chemistry is different. Non-Toxic does NOT mean that the product is safe to be worn on the skin. It basically means if you accidentally eat some of the product, you won't die or have any adverse, long term effects. According to Consumer Reports' Eco-Label Guide, “Non-toxic” is not meaningful and can be misleading. There is no definition or standard used for judging whether a consumer product or its ingredients are “non-toxic,” and no assurance that such a claim has been independently verified. A product that does not meet the definition of “toxic” according to the Consumer Product Safety Commission should not necessarily be considered non-toxic." Check out this blog post for more info on using "non toxic" paint like Acrylic, tempera, etc for face painting. So what do the face paint manufacturers have to say on this topic? "Neon paints have a special pigment that allows them to shine under the black light. They are considered for special effects only because that pigment is not considered a cosmetic in FDA standards. It is accepted as a cosmetic in other parts of the world, but it costs too much money for our government to do the testing to approve it as such. Independent testings have proven them to be safe and there have been no reports of any reactions." "With Day Glow Colours, the dye is embedded in a resin and has no direct contact with the skin. So what Pigments ARE FDA approved, and what are their restrictions? "There are eight fluorescent colors approved for cosmetics, and like other colors, there are limits on how they may be used. None of them are allowed for use near the eyes. (Check the Summary of Color Additives again.) These are their names: D&C Orange No. 5, No. 10, and No. 11; D&C Red No. 21, No. 22, No. 27 and No. 28; and D&C Yellow No. 7." "Luminescent colors glow in the dark. In August 2000, FDA approved luminescent zinc sulfide for limited cosmetic use. It's the only luminescent color approved for cosmetic use, and it's not for every day and not for near your eyes. You can recognize it by its whitish-yellowish-greenish glow." D&C Orange No5 - may not be used in the area of the eye. D&C Orange No. 10 - may not be used in the area of the eye. D&C Orange No. 11 - may not be used in the area of the eye. D&C Red No. 21, - may not be used in the area of the eye. D&C Yellow No. 7 - may not be used in the area of the eye. I have checked all of the lists and links on the FDA site and cannot find D&C Orange No. 22, No. 27, or No. 28 listed anywhere. If anyone has this info, please do tell! The FDA's site says they are approved for cosmetic use, yet these aren't listed on their own list of approved dyes so I'm not sure of their use restrictions, if any. SO, in researching the FDA's site, we can learn that the words "FDA Approved for use on skin" does NOT even necessarily mean that it is approved for use around the eyes. However, this is easy to work around when face painting...many artists who do use neon paints simply keep them away from the eyes and lips. I tend to do this anyway with all of my colors. I don't believe that any face paint manufacturer recommends using paint on or too close to the fleshy, wet part of the eyes though. See what the FDA has to say about face paints here. "FDA has to decide how they may be used, based on safety information. A color that's OK on your tough fingernails or your hair may not be OK on your skin. Colors that are OK for most of your skin may not be OK near your eyes." 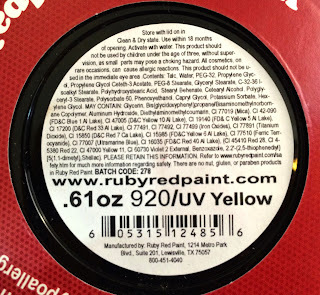 When studying your package labels, to determine if your UV makeup is in fact using FDA approved pigments, they legally must list the following before the list of pigment numbers: "Bis(glycidoxyphenyl)propane/Bisaminomethylnorbornane copolymer, Aluminum Hydroxide"
So What Brands ARE FDA Compliant? 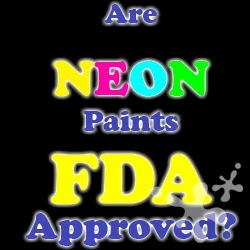 Snazaroo and Ruby Red are the only brands who's neon paints use only the FDA approved neon pigments. 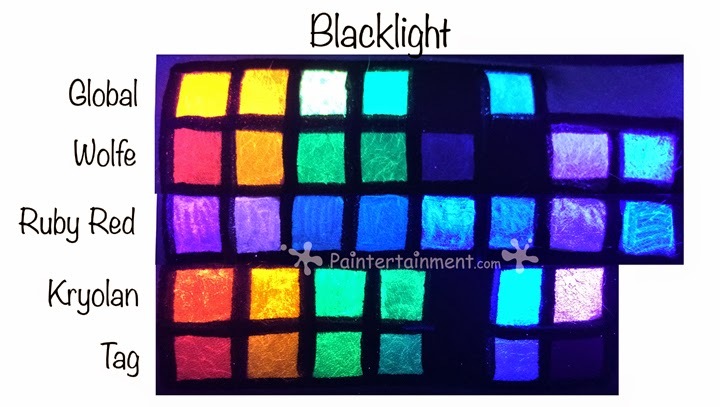 Their neon paints do not look bright and fluorescent under normal light, but they do glow under black lights. So, if you are doing a black light event and using it purely for it's appearance under black lights, then it's a safe route to go, if you still keep it away from the "immediate eye area," which Ruby Red defines as that fleshy, wet area around the eyes. This is because the eyes absorb things into your bloodstream much faster than your skin. For this reason, it's a pretty common warning that all makeup manufacturers make on their products. 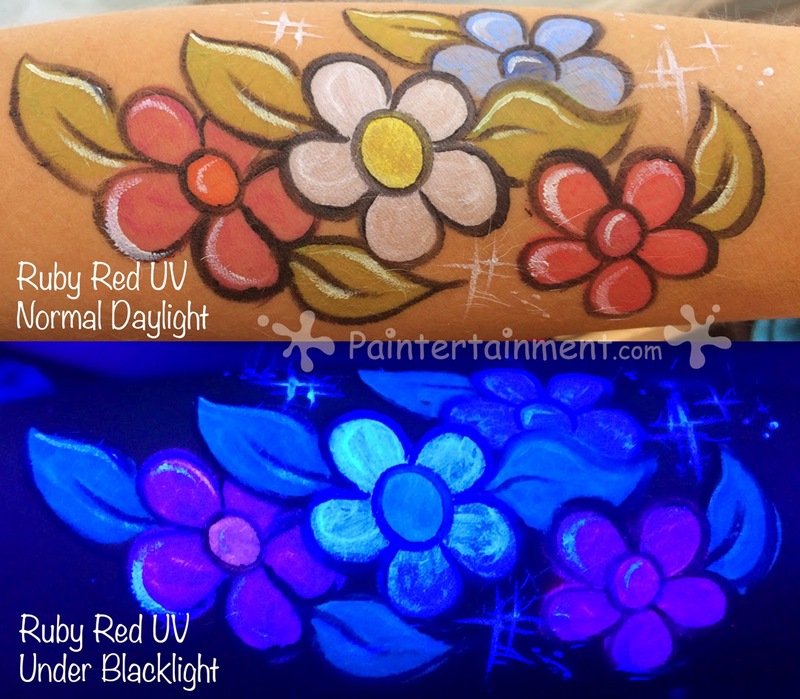 Above is an example of Ruby Red's UV makeup, shown under normal daylight and black light. 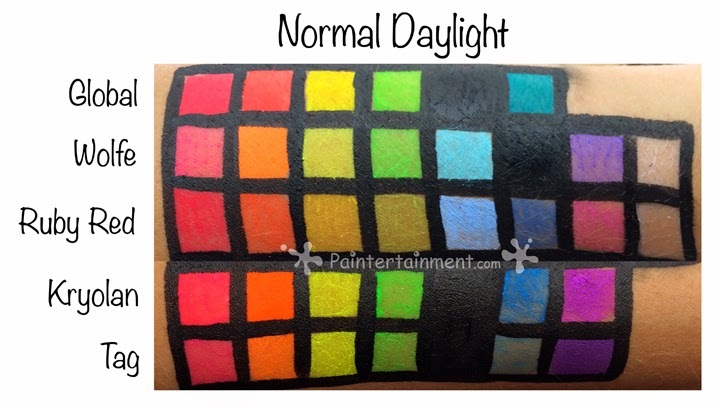 As you can see, the colors do not appear super fluorescent under daylight (that's because they don't have the day glow pigments that other brands use, which are not approved for use in cosmetics by the FDA). However, they do glow under black light. How Do Various Brands Compare? The images below show swatches of various brands of neon makeup under normal daylight and black light. Can't Manufacturers Just Pay For The FDA Testing? "The FDA does not approve colors for us, nor approve any company. Not how it works. The FDA has a list of pigments that we have to pick off of, they also have a list of pigment manufactures that are certified by the FDA to make those pigments and these companies do have random testing on the pigments. Not sure where this rumor got started, but we are unaware of any way for us to pay to have a pigment get approved that is not on the list. We can submit pigments to see if they will test them eventually to see if they would pass, but the waiting list is years and years (we submitted some 7+ years ago, still waiting). DayGlo has had some of its colors approved, and I think that was a very long and expensive process. They are the manufacture, so they have the ability to submit colors to the FDA for approval. We buy pigments from them and use them in our products. (One of their products we use is the FDA approved Clear glow pigment) I have been told that bigger cosmetic companies pay independent testing labs to do full toxicology reviews/tests for them and then simply tell their customers that even tho the government hasn't tested/approved the chemicals their own labs have. This may be what the rumors originated from." So what's a Painter to do? 1 - "No Way!" - These artists assume that because a color is not FDA approved for use on skin, it is dangerous, not worth the risk, and they don't use any at all. 2 - "Meh...So-So" - They use some neon paints, in moderation. They keep it away from the eyes and mouth, and remind their clients to wash it off after the event or at least before bed. 3 - "Warnings? What For?" - These artists believe that since the FDA has not deemed it harmful enough to test, & has not been tested and shown to be dangerous, that the risk is minimal, so they use it however they wish. "With great artistic talent comes great responsibility!" At least until the FDA decides to finally test the super bright, day glow pigments for cosmetic safety, everyone will continue pointing their fingers back at one person...YOU. The FDA puts it in the manufacturer's hands, and the manufacturers who use non-approved pigments with their labeling loopholes put it right back into yours. Regardless of what category you put yourself in, you are the one responsible for the outcome. I hope that this blog post will help you to choose wisely! What if I Witness a Reaction to Neon Makeup? The law does not even require that bad reactions to cosmetics be reported to the FDA. 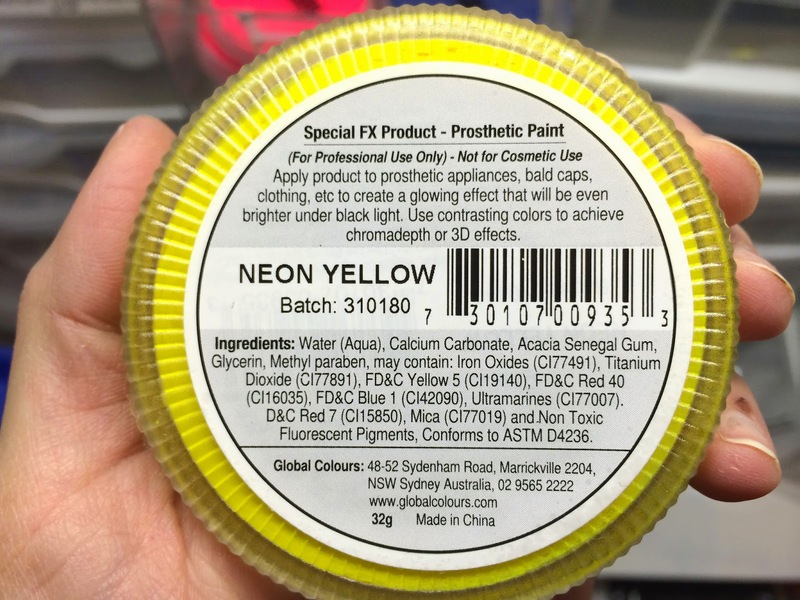 So, if you do in fact ever hear about someone having a bad reaction to neon paints, please contact FDA’s problem-reporting program, MedWatch, on the Web or at 1-800-332-1088; or contact the consumer complaint coordinator in your area. THANK YOU for this post. I just read on the back of Daimond FX neon palet NOT INTENDED FOR COSMETIC APPLICATION. i immediately was worried just like your article stated.. LOL. I can send a photo if you like.